I’m so happy to present our pretty new laundry room that we build with our own hands, and well, technically my dad’s hands too because he helped us hang the cabinets. It has been a labor of love and has taken some time to pull together, but it was pretty simple to execute even for a novice like myself! So happy with the final result, I may actually want to do laundry. OK, maybe just a slight exaggeration, but I’m still super excited to see the final product! When we built our current home a few years ago, I wanted to use our funds in key living areas, so let the laundry room go with the bare minimum. That was definitely the right decision at the time, however, I soon realized that we see this room all the time because it is directly across from our bedroom. The bare walls, wire shelves, messy bins, and overflying laundry were in the face every morning as walked out of my bedroom to start my day, instantly making me feel cluttered, unorganized and flustered. 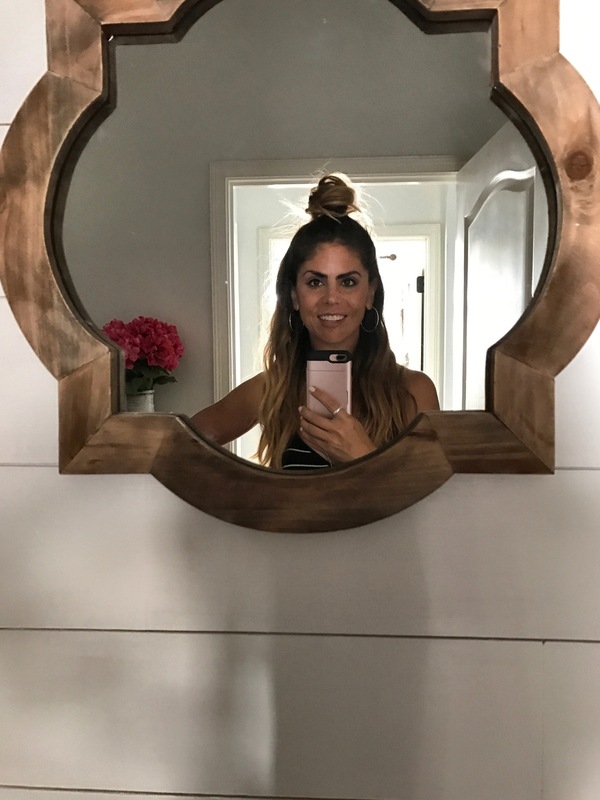 Thanks to a mild obsession with Joanna Gaines, HGTV show Fixer Upper, and her lovely store Magnolia, I have been looking for a chance to incorporate shiplap and that “Magnolia look” somewhere in our house. I love how shiplap look can instantly add character while still keeping the color pallet light and airy. During the last year or two I read several how-to articles about installing DIY shiplap look walls at a fraction of the cost and effort. I thought that this would be a great room to try it in because it is relatively small and in the event I really screwed it up, it wouldn’t be in one of the main living areas. We did all the work ourselves and the walls and counter cost less than $250. It’s easy to get the shiplap look at your house with a quick trip to Lowes and your SUV to carry the wood. Instead of actual shiplap boards which are a more pricey and difficult to manage, you can purchase large sheets of quarter inch thick plywood. If you tell them what size you need, Lowes will happily cut the wood into smaller pieces for you for no additional cost. I recommend 5 inch thick strips for this project. A plywood sheet that is 4 x 8 feet goes for just under $14, so it’s pretty inexpensive to cover a wall. 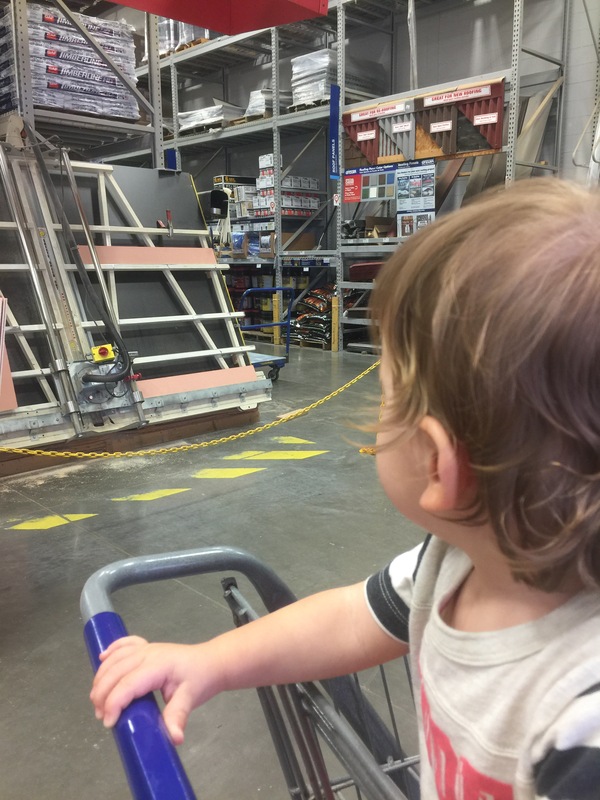 Max likes all the activity and machines at Lowes, and he loved watching operating the saw for our project! After you have your 8 foot wood strips cut, pick up a dremmel saw to cut the pieces length-wise to fit your space. This tool runs around $100, and is handy to have around the house. The tool can be used with different blades for cutting wood, plastic and tile. 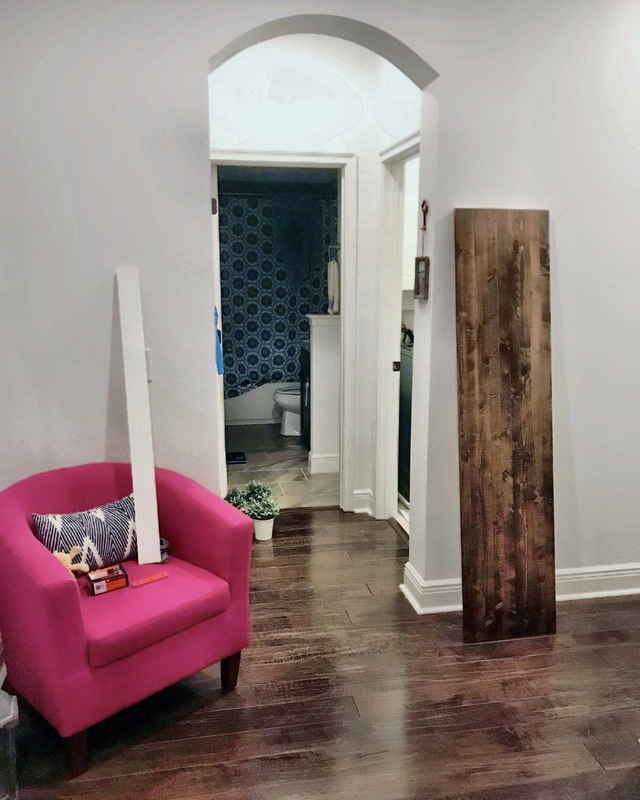 Use a level to mark a horizontal line on your wall and nail in your first board. Some people use nail guns, but I just used an old fashioned hammer and brads. After the first board is up, just continue along the same line horizontally and then install the wood vertically after that first line is complete. Use nickel coins for perfect spacing between the boards, and use your level periodically to make sure you stay level. This unfinished wood really soaks up paint, so I bought a paint with primer to help minimize the number of coats. You can use a roller to apply the paint, but I prefer to drag the brush across the panels horizontally to help give it additional texture and mimic the grain feel to the wood. Adding storage in the laundry room was a must, especially since we have a pretty small linen closet at the opposite end of the hallway, so I purchased taller 42 inch cabinets to maximize vertical space. I ordered our shaker style cabinets from Lowes, but IKEA is fantastic option for cabinets and counters at really reasonable prices. My parents happened to be visiting when we picked the cabinets up, so my dad and Matt were able to easily install by mounting them into the studs. After the walls were complete and the cabinets were successfully mounted, it was on to the build the counter. For this part of the project I stained two panels of wood, using smaller 1 x 4 inch beams screwed into the studs in the wall to mount it over the washer and dryer. I trimmed the boards lengthwise with the dremmel tool I purchased earlier in the project. We screwed the counter to the side beams but can remove them if we need to access behind the washer and dryer. The counter cost about $50 total. I wanted the room to have a clean and airy feel with natural textures and calming pops of blue in the rug. I used this extra large framed map to cover the ugly fuse box on the wall opposite the washer and dryer, and picked up the rug, mirror and light fixture from from Joss and Main. This metal sign is from a vendor in a cool shop in downtown Winter Garden called Adjectives Market, and we have other wooden signs from this same artist in other rooms in our house. Shop my Joss and Main items below (the light is sold out so I’ve included a few similar styles).